Welcome to the Clinton Arms. Nestling behind the village green in Frithelstock and opposite the 13th Century Parish Church of St Mary and St Gregory, our 17th Century Inn provides comfortable en-suite bed and breakfast accommodation (for overnight B&B or longer periods) and excellent restaurant serving food, ales and wines. You will find us in the hamlet of Frithelstock, near Torrington in North Devon and just off the main A386 between Torrington and Bideford. Your hosts, the Robertson Family, extend a warm welcome to both locals and visitors alike; whether you have come to stay with us, to sample the meals freshly prepared by our Chef or just to enjoy the friendly atmosphere of our bar and indulge your taste for real ales or fine wines. The Restaurant serves Food at lunchtimes and evenings seven days a week. In fine weather you can enjoy your drinks or meals sitting outside on the village green in front of the pub. We can arrange fishing outings - please ask for details. We cater for private functions and hold numerous special events throughout the year. If you are visiting Torrington and would like more information on the Bed & Breakfast Accommodation or Restaurant please contact us on 01805 623279 or e-mail to enquiries@clintonarms.co.uk Go to Contact Us for full details. 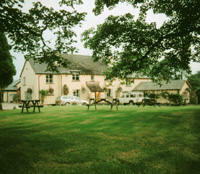 The CLINTON ARMS, Frithelstock, Torrington, North Devon EX38 8JH.